"Actress will be first female African American Star Trek lead"
Since Star Trek: Discovery was first announced earlier this year, former showrunner Bryan Fuller (who has since stepped away from the project to focus on his upcoming Starz series American Gods) repeatedly stated two things about the series. First, it would follow a non-Captain character, telling Entertainment Weekly that "[w]e’ve seen six series from the captain’s point of view. To see a character from a [new] perspective on the starship — one who has different dynamic relationships with a captain, with subordinates, it gave us richer context." And, second, the lead of the new series would be a woman of color- the first such central character in the long and storied history of Star Trek. Today, it was announced that the series has found its leading lady. 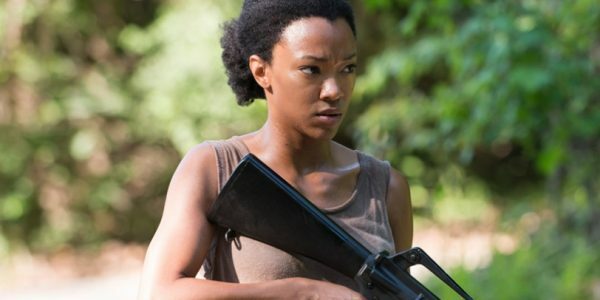 Sonequa Martin-Green, who currently portrays Sasha Williams on AMC's The Walking Dead, will be taking on the role of Lt. Cmdr. Rainsford on Star Trek: Discovery. What this means for her fate on the zombie series is unknown (The Walking Dead generally films from March through December, which could work around the Star Trek schedule, but it is entirely possible Sasha, who is hellbent on taking down villain Negan, might not be long for the Walking Dead world), but the addition of Martin-Green marks a huge moment in Trek history. Martin-Green will be joining already announced cast members Michelle Yeoh as Capt. Georgiou, Doug Jones as Starfleet science officer Lt. Saru, Anthony Rapp as science officer Lt. Stamets (who will be Trek's first openly gay character on a television series), and a trio of Klingons, played by Chris Obi, Shazad Latif and Mary Chieffo. Star Trek: Discovery will premiere this May on CBS All Access, the network's online streaming site.